London mayor Boris Johnson has backed a call by Conservative backbenchers for a government bill on a referendum on the UK's membership of the European Union. In a Daily Telegraph article, the Tory mayor said David Cameron must make clear Britain is "ready to walk away" unless its relationship is reformed. But Mr Johnson said quitting means "we would have to recognise that most of our problems are not caused" by the EU. Two ministers earlier said they would opt to leave if a vote were held now. However, Education Secretary Michael Gove and Defence Secretary Philip Hammond both said the prime minister must be given a chance to bring powers back from Brussels before the country decides. Mr Cameron has promised to hold an in/out referendum by 2017 - if the Conservatives win the next election - but has said he would campaign to stay within the EU if he was able to secure a new relationship. The Tory backbenchers have tabled an amendment to the motion welcoming the Queen's Speech - in it, they express regret about the absence of legislation paving the way for a referendum. Mr Hammond said it would be "defeatist" to leave the EU without attempting reform and said he believed there was a "reasonable chance" of securing sufficient changes. The London mayor has previously said that his "view has always been narrowly in favour of staying in, particularly for protecting British interests in the single market". In his Daily Telegraph article, Mr Johnson writes: "I personally back legislation now to make sure that referendum goes ahead. "It will be a good thing for everyone, because we will all have to focus not on the feud... but on what is actually right for the country". "If we are going to have any chance of success in the negotiations, we need to show that the UK is willing to walk away." He added: "As the leaders of the EU devote more and more of their time and energy to the single currency and its problems, we cannot honestly claim to be 'at the heart of Europe'. "The prime minister is absolutely right, in this context, to go for a new and more mature relationship". The London mayor goes on to list possible advantages for leaving the EU, including saving money and having more powers over immigration rules. 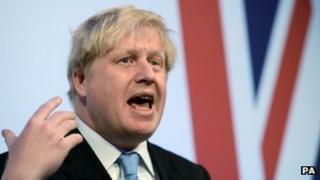 Mr Johnson said "perhaps the most important point of all" was that the UK would "no longer" be able to "blame Brussels". He said: "If we left the EU, we would end this sterile debate". Mr Johnson said "most of our problems" were caused by "chronic British short-termism, inadequate management, sloth, low skills, a culture of easy gratification and under-investment in both human and physical capital and infrastructure". He said: "Why are we still, person for person, so much less productive than the Germans? That is now a question more than a century old, and the answer has nothing to do with the EU. In or out of the EU, we must have a clear vision of how we are going to be competitive in a global economy." Among reasons for staying in the EU listed by Mr Johnson were that international companies could be put off from investing in the UK and a risk that leaving would be "globally interpreted as a narrow, xenophobic, backward-looking thing".